We’d love your help. 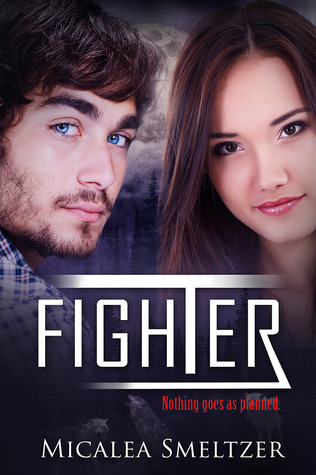 Let us know what’s wrong with this preview of Fighter by Micalea Smeltzer. First she was an Outsider. Then she became an Insider. And now… she’s going to have to be a Fighter. Nothing goes as planned for Sophie Beaumont. She thought that Travis had been defeated. She believed that they would all finally be safe. But Travis never left. He has a plan and it's one that no one could have ever guessed. It will take everything Caeden and Sophie’s pack has First she was an Outsider. To ask other readers questions about Fighter, please sign up. There is some really good comedy in the book that had me laughing so much I was in tears. All I will I've read many books and this is my FAVOURITE ! I cant say enough good things about this book, I would recommend it to ANYONE !!! There is some really good comedy in the book that had me laughing so much I was in tears. All I will say is, 'Thunder from down under' and 'dipshit here thought you was dead' - I know they're just little things but they made me laugh so much, as well as much more. It starts off with Caeden and Sophie in their beach house after Caeden has just let out that Travis Grimm is alive ! Sophie is quite angry and storms off and drives around for the rest of the day trying to clear her mind. After getting sorted she goes back and talks to the pack like a true alpha and gets back on track with Caeden. They spend the rest of the trip forgetting about shifter life and have fun, including spending the day at the beach and going clubbing ! Once they return home its time to get rid of Travis and THE WEDDING !! !The chapter of the wedding made me so happy, its so lovely !!! But once that's over Caeden and Sophie's life is surrounded by pack and trying to kill Travis. Suddenly, on day when Caeden and Sophie are sitting in their lounge when somebody knocks on their door. It turns out to be Caeden's childhood friend Nolan (a tiger shifter). He is a couple of years older than Caeden. The pack soon locate Travis's whereabouts and are preparing for the fight. However that strange scent is still lingering. Soon the fight plan is in place and everybody is in position to attack Travis. But there's a twist ... Mutants !! Travis has created mutants !!! Sophie and the rest of the pack fight off the mutants while Caeden and Travis fight. Sophie and the rest of the pack fight off the mutants very well, but one in particular was very big and strong and got Sophie at a bad time. He hurt her pretty bad and she couldn't fight back. As he was about to kill her Logan took him down and saved Sophie's life, but as he walked away, he didn't bother to check he was dead. The mutant grabbed Logan and killed him. Bryce come and got Sophie because Caeden needed her to heal him. Next Sophie woke up in the hospital with Caeden sitting next to her. She finds out that some how Travis got away. She's torn up when she remembers that Logan's dead and to find out that Maria, another member of the pack, died to. But soon after everything gets back on track and their lives go on. Caeden's birthday approaches and Sophie organises party for him inviting the pack and the seven boys (Sophie's football mates) and everything is ok. They all exchange presents and Sophie has a little surprise to tell everybody. THEY'RE HAVING A BABY !!!!!!! I absolutely love this series!! I am SO happy when a new book comes out and so sad when I finish it and have to wait for the next one! I HIGHLY recommend this book! This third book is my favorite so far! This Book Is AMAZING! All I can say is that Micalea Smeltzer has done it again! This book was filled with action, suspense and a love for the characters you wil never forget! Not to mention that the ending of this book leaves you wanting more! I just loved the book. But I hated the cliff hanger. I can't believe, and this will be a spoiler for those who have not read the book yet, but, I CAN'T BELIEVE CAEDEN AND SOPHIE ARE GOING TO HAVE A BABY!!!!!!!!!!!!!!!!!!!! I just can't wait for the 4th book. More Sophie and Caeden Please!! Can't wait for the fourth and final book!! Fighter by Micalea Smeltzer is the third book of the Outsider Series. It was an amazing book which I finished in a day. The book picks up at the very end of Insider when Caeden says that Travi's isnt dead..... Then in Fighter it goes on how Sophie is upset that Caeden didn't tell her.. Fighter has a lot of romance, surprises and action. My favorite part was when Sophie give Caeden his last birthday present!! Overall, this book was fabulous and Micalea has done it again!!!! Cant wait to read the 4th Fighter by Micalea Smeltzer is the third book of the Outsider Series. It was an amazing book which I finished in a day. Cant wait to read the 4th and final book. Ok seriously. Do you HAVE To end all of your books with a cliffhanger? I SWEAR. I can't wait for number quatro. I think that's how you spell it. I am obviously not spanish though so I did my best. The good thing was that it was a good cliffhanger unlike FORBIDDEN. That made me pee my pants and cry at the same time. Ohhhhhh. Ok. Enough of my rant. Good read Micalea's latest artwork/masterpiece. This is by far my favorite book in the series so far!!! I absolutely loved it! A MUST READ!!! Cannot WAIT for the next book to come out! They finally get another shot at the psychotic sob Travis but it comes with a price. It made me cry. WHEN IS THIS COMING OUT!!! Ok, I love that they got married. I know it's young but they are mates so I don't see the point in waiting. I don't love how travis is still out there. Once again I enjoyed the book. While I did have some problems with the book and it was a bit cheesy overall I did enjoy the story and I have no idea why. It was drawn out, slow, like the author wanted to extend it but didn't know how. There were some errors but not to the point of distraction. I'm not sure if I want to continue reading this series. It's taking to long....... Making me not really care what happens to any of the characters. Bored I wanted to give it a 2 1/2 star review. I liked it but it was just ok. Fighter is book 3 in the Outsider Series. I really enjoyed by re-read of Fighter and can't wait to continue with my re-read of the series. I love Caeden and Sophie. Awww I enjoyed seeing Sophie + Caeden take it to the next level and start nesting together. There is the whole Travis/ Grimm thing going on as well, and both Caeden + Sophie settling into their Alpha roles. Good continuation of the story. OMG!!!!!! That ending nearly killed me! I was so freaking excited that I felt like my heart was about to jump out of my chest and do an Irish jig. I can't believe IT happened! Go Caeden!